Startups Magazine speaks to two cycle-tech startups, Beryl and JIVR, working on solutions to tackle urban congestion and pollution. London is one of the most polluted areas in the UK, and as Emily Brooke MBE, Founder of Beryl said: "London was designed for people to live there and drive cars – but wasn't designed for this many people and this many cars." Since 2010 the city has in fact suffered from illegal levels of air pollution, and dangerous levels of nitrogen dioxide which mainly comes from diesel vehicles. However, thankfully some people are taking action, there are a number of startups working to get more people travelling and commuting via bike, especially in large cities. Beryl's mission to make a better world through bikes is similar to that of JIVR, a startup that created the world's first electric, foldable and chainless bike with the aim to encourage commuters to change to a more economical way of travelling. Beryl creates bike accessories to make people safer and feel more comfortable when cycling in large cities. Beryl believes that bikes have much to offer cities, as part of an enlightened transport system, and can allow transport to flow in the most clean, simple and sustainable way. On another tack, Cycle.land developed out of the Oxford University Innovation incubator, is a bike sharing marketplace startup with the aim to unlock the assets of unused bikes to move towards globally sustainable urban transport. The idea is to make bikes readily available and affordable, because as cities grow at rapid speeds without sustainable infrastructure, there is a strain on transportation, congestion and pollution. So simple but effective? Is the 202 year old bicycle the answer to some of our biggest pollution problems? Cycle.land strongly believes the simple but effective bicycle could be the disruptor we need in urban mobility. 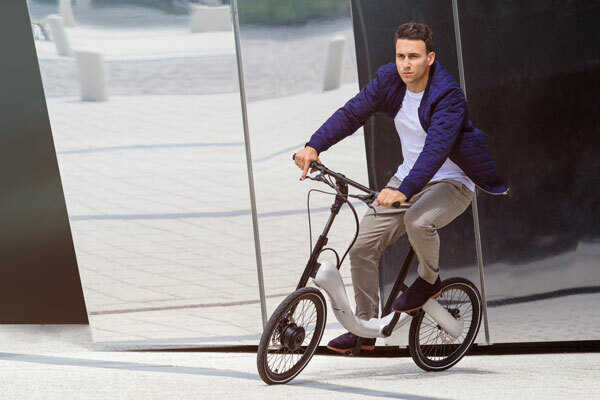 The startup has successfully raised over £200,000 in a second equity crowdfunding campaign through Seedrs, and has so far successfully completed the European launch and operation of billion-dollar mobility startups in bike sharing. The message here is clear, bikes are the next big thing and not only are all these cycling startups encouraging us to save the planet, but they are also trying to save our health. Exploring cities, cycling and safety solutions, Beryl addresses the frightening statistic that 79% of bikes are involved in accidents travelling straight ahead with someone turning into them. When Emily Brooke, MBE and Founder of Beryl, decided to change university course from physics at Oxford to product design at Brighton she found herself behind the wheels of a bike in a big city and found it very stressful. "I was a student and I had never been on a road bike as an adult, and when I changed universities, I spent all summer learning to ride a bike in the countryside which was lovely, relaxing and beautiful but in the cities I found it exhausting, stressful and dangerous." Brooke trained for four months and then cycled 1,000 miles from the tip of Cornwall to the tip of Scotland, which is where she essentially learnt how to properly ride a bike. Then the following week went into her final year project back at Uni, Brooke said: "Having just fallen in love with cycling I gave myself the theme of urban cycling, and wanted to identify and tackle the biggest problem for cyclists." Safety is the biggest worry for people who cycle in the city, and the biggest barrier for people who don't, Brooke explained. 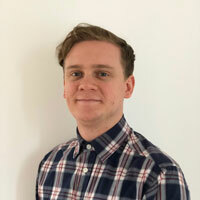 "I spent six to eight months working with a driving psychologist researching and looking at the data and statistics of road accidents." Brooke said one statistic in particular amazed her: 79% of bikes are involved in accidents travelling straight ahead with someone turning into them. 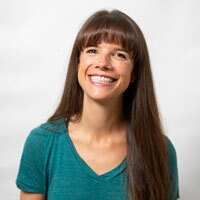 Brooke said: "I was thinking about that problem, biking around town and I could see a white van in front of me and I remember thinking if I was just five yards ahead he would see me. I wish I had a virtual me warning him I was coming." And this was the eureka moment! Brooke thought: "I can project myself in front of me," and from here the Laserlight was born, a device which projects a bright laser image on the road ahead of you to let drivers know you're there – even if you're in the blind spot! The Laserlight was Beryl's first product launched on Kickstarter back in 2013 with the next generation, the Laserlight Core, launching last year. Both models include the same core functionalities; the quality of optics and lasers, they are both waterproof and have a high-quality battery. But the Laserlight Core does have a few key differences, it's lighter and also has a day flash mode and bracket which is removable in one movement. The main mission for Beryl is to build a better world by getting more people in cities on bikes. Brooke said: "The Laserlight tackles one of the biggest barriers for personal safety. It's the number one reason people don't get on a bike in a city, so anything we can do to make people feel more visible and safer we will, and have." Brooke explained further that they believe by getting more people on bikes it will mean less people in cars and on public transport, which will make a big difference to everyone in the city. Beryl, has not always been known as Beryl, it was formerly called Blaze. But thanks to an American company and American trading laws Brooke had to change the name, which she described as extremely difficult. "Everything these days is a name that could sound like or be like something else, so finding something that isn't already taken or protected is near on impossible." After two creative agencies, endless brainstorming, and almost a year of working on it the name Beryl was discovered. "A friend in America had the idea. Beryl Burton was this amazing British cyclist role model, she won 90 domestic championship medals, seven world championship medals, and set the MEN's 12 hour time track record, which she held for two years before it was broken." Not only that, but the word Beryl also derives from an emerald which is of course, green. Brooke explained: "That iconic colour green you see on the streets of London, New York, Montreal and everywhere where there are cyclists – which links to the green gem, the emerald." Beryl has a number of products that all relate to cycling and more importantly safety and visibility. She explained: "One of them in particular, the Pixel, is fantastic for runners, as it's a very small light." The Pixel can be a front light or back light as it has both a red and white light, and can be clipped on to the front or back of your bike, on to your clothing, your helmet or even your dog when out running. Brooke said: "It's really versatile and ideal for runners because if you think about it the amount of people out this time of year training for marathons, getting up early before work, or even after work when its dark - you see very few with lights on." Beryl has two sides to its business. There is the consumer side, but it has also integrated its technology into fleets of bikes, the latest of which are in London. Brooke said: "The 12,000 Santander bicycles have our lasers on them. We have done this twice, the first time we kitted out the fleet, and we actually co-designed the second release of Santander bicycles." Beryl's lasers are also in the bikes of Montreal, Glasgow and New York, and Brooke said she loves travelling around the world. "We are obviously more successful in commuter cities, for example New York." Brooke, at the age of 31, has received an MBE for services to transport and the economy back in 2017. "I have no idea how I got it – it's all very secret," Brooke exclaimed. "I was very very shocked, my mother was even more so. She thought I had got a speeding ticket, which is impossible as I sold my car for my bike, and put every penny towards the bike!" Brooke explained further: "To start with I felt quite embarrassed, I work with some very accomplished, often much older men in this sector, and it felt a bit uncomfortable to just pop up and get an award. But actually someone commented on my sister's Facebook page, 'if any young person out there has an idea and doesn't know whether they want to pursue it – this is the reason why you should'." Brooke explained it can be tough in this industry, as it is a competitive space especially with all the cheaper products being made in China, but Brooke claims that Beryl is unique as the Laserlight is the only product in the world that projects a laser light metres in front of the rider. However she described her hardest challenge as: "Finding women to join the team, we have quite a big engineering team, and typically that has more male applicants." But she did assure me there are more women on the team now. JIVR is the world's first electric, foldable and chainless bike – all in one package. Yes there are other electric foldable bikes and foldable chainless bikes, but JIVR is the first product that has all three. You can fold it, charge it and there's no need to fix the chain. Headquartered in Poland, JIVR aims to help cut down the number of urban commuters on public transport, whilst aiding these commuters to deal with the traffic congestion that comes with city life. The company was founded back in 2011 by Marcin Piatkowski who was at the time studying in London. When meeting with Joseph Cardone, JIVR's UK Sales Representative, in the streets of London to test the bike out myself, he explained: "The goal is to get more people out of their cars and on bikes. Our product is saving the planet and encouraging more people to be more active." What are the biggest reasons people put off cycling? 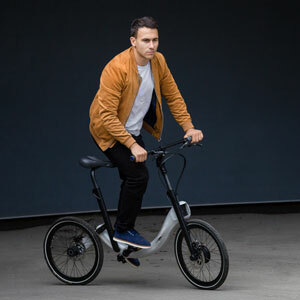 We often hear commuters say they don't want to be sweaty or dirty by the time they get to work, or that they often take the tube or train so it's hard to take a bike, therefore JIVR designed this bike to answer these excuses. The design includes the electric feature, yes you still have to pedal (it's a legal requirement for a bike to have pedals, otherwise it's a scooter!) But by just pedalling once, depending on which setting you select through the button on the handle, it will give you up to three times the power. "A lot less effort means a lot less sweat!" Cardone explained. 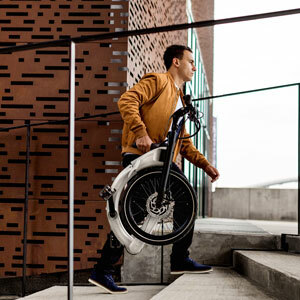 Of course the foldable feature is so that users can take the bike easily on and off trains, tubes and even in the back of a taxi if it's been a tough day. The foldable feature also means the bikes can be kept indoors, at home or at the office and take up half the space. Finally the JIVR bike is chainless to prevent unnecessary mess, so you can get to work as clean as you left home. The company is also in the process of adding a mud flap to prevent dirt spreading and spraying up your back. 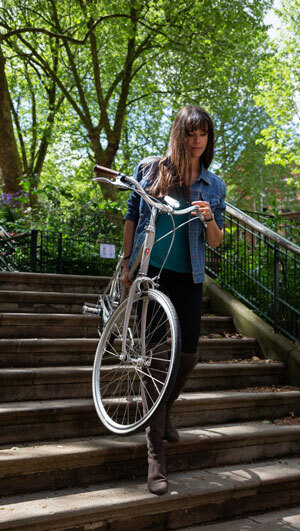 The bike has been designed to be unisex, it includes a low bike frame on purpose with women in mind. Cardone explained: "Say for example if women are wearing a long skirt or dress, the low frame means they can just step over it without having to lift their leg right up." It also comes in a range of colours again to attract everyone, but also so the product looks more than just your 'typical bike'. "It interests people who are into their technology and like to be a bit different," explained Cardone. Cardone said the warmer weather benefits the profits: "In the summer we had a big boom due to the weather, as people especially love riding a bike in the summer so we're hoping for the same again this year." JIVR is currently in the process of fundraising and is looking to raise €850,000 on Seedrs, which will go towards the development of four new products. JIVR Senses is one of these new products which essentially is a project that aims to improve the rider's safety. The rider's safety and security is an important issue for JIVR and JIVR Senses helps in making them more visible by delivering additional 'senses' and post-factum footage. JIVR Senses will consist of a set of sensors and recorders in order to monitor the environment around the cyclist. It will also include a black box to store the data, and an accelerometer to identify the cyclist's position and detect suspicious movements. JIVR is currently being used across Germany and England with plans to expand to Spain. Martin Kasz, Product Marketing Lead, also commented and said JIVR consider themselves to be a disruptor in the market as it is completely reimagining the cycling experience, especially from the viewpoint of safety, by implementing technologies pioneered in the automotive industry that have become standard there but, for some reason, haven't migrated to e-bikes until now. Kasz added: "Today's consumer is used to constant and useful technological enhancements in any number of areas in their lives but, when it's time to hop on a bike, their expectations are stuck in a time decades ago because manufacturers have not conditioned customers to expect a different bike, a better bike than what they used as a child. We're updating everything about the bike itself, how it's used and the ways it can improve the lives of riders."